Fiji Puffer Needs Help I have an orange tailed Fiji Puffer. He hasn't eaten in 2 weeks and seems lethargic. I've read other postings but haven't found any similar to mine because my tank has never experienced infestations. His tank mates are a Picasso Trigger and an Assorted Puffer. Both fish are eating and responding normally in the 50 gallon tank. <... well, many puffer species do go on occasional feeding strikes... and they rarely are compatible with other Tetraodontiform fishes (triggers, other puffers) in such small quarters... that is, there is likely a psychological component at play here> Tank conditions are ideal, 78 degrees, salinity 1.023 - 1.025, Zero or minimal nitrates, nitrites, and ammonia. All fish enjoy eating a varied diet of freeze dried krill, frozen brine shrimp, and live minnows. 25% of tank water and filters are change every 4 weeks or so. I've had the Fiji for almost 3 months. The Fiji's behavior began to change after the last tank change. I did move the live rock that he normally sleeps on. <Good point... puffers REALLY don't like changes in their physical environment... often return to same sleeping place for years> The fish get along. The trigger nips once and a while at both fish but never breaks the skin or continues for a period of time. 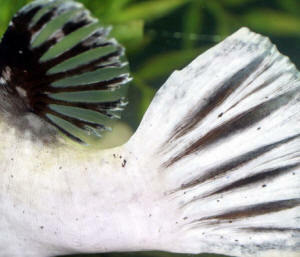 Any thoughts on what could've caused the puffer to stop eating and become less responsive? He is relieving himself on a regular basis so I was thinking he might be eating something else. He also does seem a bit more bloated but he does not have any spots or change in color that would indicate parasites, disease, or injury. <Please read here: http://wetwebmedia.com/pufferfdgfaqs.htm and the Related FAQs beyond (linked, in blue, at top) Likely, only time need go by, some other food types offered... but in the long/er term, you need a bigger tank. Bob Fenner> Thanks!